The Short Version: More than 90 years old, four floors high, and boasting over 18 miles of books, The Strand in New York City is one of the most famous bookstores in the world. 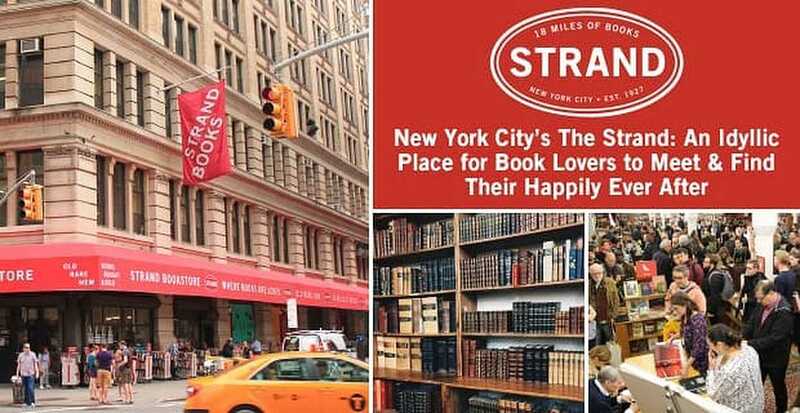 The only remaining bookstore from Book Row, The Strand is a beacon to bibliophiles everywhere with its curated selection, thought-provoking events, and key partnerships with literary and social justice organizations. If you’re looking to bond with other avid readers, this is one of the best places to do so. More than just a bookseller, The Strand is always trying new things to improve literary and social discussions as well as finding new ways to delight book lovers. Attraction is an individual thing. Everyone is attracted to something different. Some have a thing for redheads with beards, and others are stopped in their tracks by the allure of a musician. Further still, for some people, intelligence is what they find most attractive. They’re drawn to those who spend their days reading and who can recite an E.E. Cummings poem from memory and then talk about the Qin Dynasty in the next breath. Finding such a match doesn’t have to be difficult if you look in the right places, and one of the best is logical enough: a bookstore. If you’re in New York City, The Strand, which is visited by hundreds of people every day, is where you want to go. From its inception, The Strand was fueled by a personal passion for books. Leigh Altshuler, Director of Marketing and Communications, said its unique founding story could easily rival any of the stories it sells on its shelves. “The Strand is a family-owned bookstore, which was started in 1927 by Benjamin Bass. He opened the store on what was 4th Avenue, which was Book Row, which had 48 bookstores. He started the store with just $300 and his personal book collection. He just loved books,” she said. As time went on, Benjamin’s son, Fred, learned more about the business and eventually took over. Reflecting on Fred’s love of books, Leigh told us he used to run around New York and even across the country looking for something new to read. “Fred said it was often like a treasure hunt for him,” she said. He also moved The Strand from 4th Avenue to its current location and then expanded it to the four levels that it is today. Fred eventually groomed his daughter, Nancy, to be the next Bass to run The Strand. She now manages the bookstore, which is the only remaining shop from Book Row. These monthly to multi-monthly events feature panels on specific themes. In March, the discussion will be about the classic book “A Wrinkle in Time,” and the author’s family and biographer will be in attendance. At Pen Out Loud: The Opposite of Hate @ Subculture, you can explore how hate and hate rhetoric are making this one of the most contentious periods of history. Attendees, including respected journalists, will learn about the roots of hate and then talk about how society can overcome it. Of course, a bookstore of this magnitude has an impressive array of book readings and signings regularly. In March alone, the team will host Andrew Lloyd Webber, Sarah McBride, Duane Michaels, and Mike Epps, among others. You can also attend puzzle parties and Dungeons and Dragons meetups — as well as National Book Critics Circle Finalist Readings and a panel on urban planning in the modern age. She added, “We have weddings here almost every Saturday night. We’ve had writers as well as book lovers rent out our book room to get married in. It’s really cool.” The Rare Book Room is where you can say your vows surrounded by your friends, both human and hardcover. Marvel at the antique and rare books and fun bookish décor as you enjoy a wedding that truly reflects your personal style and passion. Whether searching out that hard-to-find first edition or heading to an event, The Strand is an ideal place to come together with like-minded people. With over 18 miles of books on site, you’re sure to bump into someone looking for the same thing as you.